We are making progress, very slowly, in “reading” human brain activity. This is an exciting area of research, but reporting about it consistently falls prey to one typical formula of science reporting – lead with the most speculative and fantastical potential application of the technology. In this case just about every news story I read about the latest study involving reading brain activity leads with the idea that this technology can be used for either mind reading or dream recording. It would be better for such far future extrapolation to be buried deep within the article, after some more balanced discussion about where the science actually is. I know this is a frequent quibble of mine, but it does affect the public perception of science. The public is constantly hearing about how one tiny advance in our understanding of some aspect of biology might lead to a cure for some horrible disease. Wasn’t the genome project supposed to lead to countless cures and medical advances? Where are all the invisibility cloaks we were promised, and why can’t I watch my own dreams like a high definition movie? I try to avoid spending too much time talking about skepticism itself. Like any movement or intellectual tradition, we need to self-examine – to step back occasionally and see how we’re doing and talk about strategy. But I try not to get caught up in the “paralysis of analysis” of excessive internal focus. Having said that, a recent article on the topic of skeptics preaching to the choir deserves a little discussion. Alom Shaha wrote an article for the Guardian called, Skeptics: It’s time to Stop Preaching to the Converted. In the article I think Alom makes some valid points, some questionable points, and offers one good suggestion. His primary point, mentioned in the title, that skeptics should stop preaching to the converted is not valid, in my opinion. First, he presents a false choice – as if we can do outreach or lecture to fellow skeptics. We can, and should, do both. In fact the goals we have before us are so numerous and challenging that there are many things we need to do simultaneously to move forward. We need to educate, expand, lobby, organize and argue. I am often offered advice by fellow skeptics about what skeptics “should” be doing, as if there is one valid or best way to promote skepticism. My counter advice is always to consider that this is only one of many valid approaches. And second – if you think it’s such a great idea, go out and do it. The rest of us are busy doing what we think are good ideas. The one thing that is more absurd than homeopathy is the regulation of homeopathic products (at least in the US). Because of timely political pressure, homeopathic products were essentially grandfathered in to FDA approval. They do not require any testing for safety and effectiveness. Homeopathic remedies are prepared according to the guidelines of the Homeopathic Pharmacopeia of the United States (HPUS) , which was written into law in the Federal Food, Drug, and Cosmetic Act in 1938. Homeopathic remedies are regulated in the same manner as nonprescription, over-the-counter (OTC) drugs. However, because homeopathic products contain little or no active ingredients, they do not have to undergo the same safety and efficacy testing as prescription and new OTC drugs. I will address her main points below, but first my final thoughts on the “tone” thing. While she admits fault in setting the “confrontational tone,” I don’t think she quite gets what Orac and I were objecting to. I actually don’t mind a confrontational approach – as long as it is substantive (that’s the way science works – if you have a point to make, bring it on). We were objecting to her mischaracterizing our position and making ad hominem attacks in place of substantive criticism – essentially using the “arrogant” gambit with which we are all too familiar. Her readers obviously picked up on this, and piled one, accusing us of being bullies and thanking her for slapping us down. We objected to her logical fallacies, not her tone. I receive frequent commentary on my public writing, which is great. The feature that most distinguishes blogs is that they are conversations. So I am glad to see that science-based medicine (a term I coined) is getting targeted for criticism in other blogs. One blogger, Marya Zilberberg at Healthcare, etc., has written a series of posts responding to what she thinks is our position at Science-based medicine. What she has done, however, is make many of the logical fallacies typically committed in defense of unscientific medical modalities and framed them as one giant straw man. She is partly responding to this article of mine on SBM (What’s the harm) in which I make the point that medicine is a risk vs benefit game. Ethical responsible medical practice involves interventions where there is at least the probability of doing more benefit than harm with proper informed consent, so the patient knows what those chances are. Using scientifically dubious treatments, where there is little or no chance of benefit, especially when they are overhyped, is therefore unethical. And further, the “harm” side of the equation needs to include all forms of harm, not just direct physical harm. I am having an usually busy week, so no time for a full post today. But I will have an announcement soon that will partly explain my lack of time. 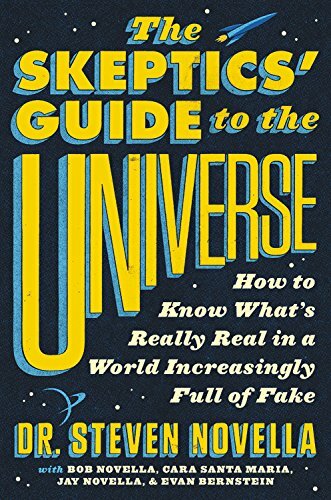 Meanwhile, for today I am just going to plug some upcoming Skeptics Guide to the Universe events. In case there is anyone reading this blog who doesn’t know, the SGU is my weekly science podcast. There will be a separate dinner reception following the show. The Amaz!ng Meeting: Australia – Featuring appearances by the entire Skeptics’ Guide cast, James Randi, George Hrab, Brian Dunning, Dr. Krissy Wilson and Dr. Karl. I have followed with interest the legal issues surrounding expert scientific testimony in the courtroom. This is one of those topics that should be well known, but is generally not known outside of legal circles or those who have been at the wrong end of a liability suit. It seems like a no-brainer that generally the public would want good science in the courtroom, and it is easy to understand the miscarriage of justice that would result from junk science. In a way science in the courtroom is a form of applied science – actual decisions have to be made, even when the science is inconclusive. In practice the line between solid science and speculative opinion is not stark, and it is that line that has been the focus of rules and precedent regarding expert testimony. A recent court decision on a case involving manganese exposure and Parkinson’s disease seems to represent a positive trend in dealing with expert testimony. The case involves Jeff Tamraz who alleged that exposure to manganese through welding led to his Parkinsonism – a family of neurological disorders. Tamraz and his wife were awarded 20.5 million dollars by a jury, who decided against the five companies being sued. Those companies appealed the decision, and an appelate judge just set aside the judgment on the basis that the court in the case overstepped their bounds and violated Federal Rule 702 pertaining to expert testimony. Perhaps I was naive, but even though I have written about placebos numerous times here and elsewhere I have always assumed that placebo pills were literally sugar pills. It had not occurred to me that placebo content needs to be specifically disclosed, and that their composition might not be as standard as I had assumed. A new study in the Annals of Internal Medicine reviews clinical trials over the last two years. They found that only 8.2% of clinical trials with a placebo pill as a control specifically disclosed the placebo content. Meanwhile 26.7% of trials involving injections and procedures disclosed the precise nature of the treatment. This difference makes sense, in that there is much more interest in the nature of a placebo treatment when it is more complex than just taking a pill. The concept of a placebo is that it is completely physiologically inert, therefore any response to the placebo is due to other factors (other than a physiological response to an active intervention). Typically, in pharmaceutical trials, the company that makes the drug being studied will also manufacture look-alike placebos. These can contain the sugar base and any other fillers, the same coating, etc. – but not the active drug. But according to the study authors perhaps we cannot assume that these placebo pills are completely inert. From the Ministry of Anti-Vaccine Propaganda and Misinformation – November 1-6 has been declared “Vaccine Awareness Week.” That is to say, Barbara Loe Fisher and Joe Mercola decided that it would be so. Fisher is a tireless anti-vaccine activist and head of the Orwellian-named National Vaccine Information Center. Joe Mercola runs a newsletter which seems to be just a marketing tool for all sorts of dubious “alternative” treatments. We have been getting a great deal of e-mail asking about the various “experiments” on YouTube (inspired by events on Fast Food Nation) in which a McDonald’s hamburger and fries are left out for weeks or months. To the surprise of some, the food does not rot away to nothing but instead shrivels a little and becomes hard and shiny, but does not get moldy or rotten. The implication is that there is something wrong and unnatural about food that doesn’t rot when left out. Unfortunately this is what passes for “science” on the interwebs. But it does provide a teaching moment – with lessons about scientific methodology and how the logic of interpreting evidence.